Configure centralized logging on multiple subnets. This simple and easy-to-follow manual can help you precisely startup and manage your NetVizor for central signing over numerous subnets on your network. 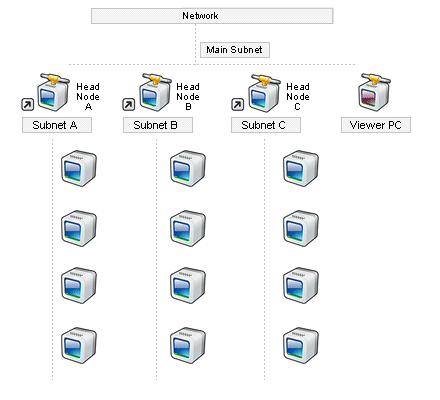 Choose the computers which are at the top of every subnet in your system (see diagram). You'll be establishing logs to be stored by NetVizor on these computers via shared files. In this plan the computer's you'd shop records on would be Head Node A, B, and D, being that they are the minds of the particular subnets. Manage the NetVizor clients on each subnet to keep their records on their regional subnet head node (chosen in step 1). For instance, in the above mentioned plan, their logs would be stored by the computers in the leftmost subnet ( A ) on the primary computer at the very top of the subnet (marked Head Node A). Follow our how-to Configuring Shared Log Storage (storing and viewing logs on a shared folder) for a detailed how-to for configuring the shared folder storage. 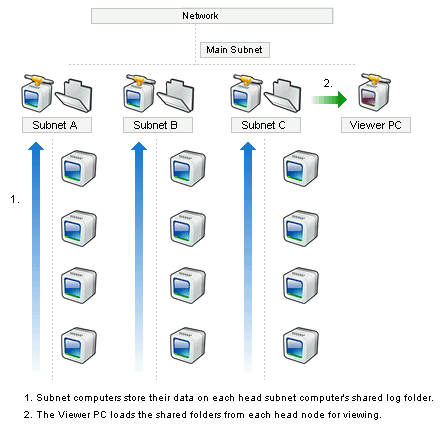 Configure the NetVizor viewer to read the shared log storage folder from each of the subnet head node computers that were selected in step 1 (i.e. : Head Node A,B, and C). See steps 4-7 from our how-to Configuring Shared Log Storage for a detailed how-to for configuring the the viewer's log location settings. The log storage and viewing of the finished configuration will resemble the following diagram. You are now set to view logs from all users on any subnet on your network from your central workstation.